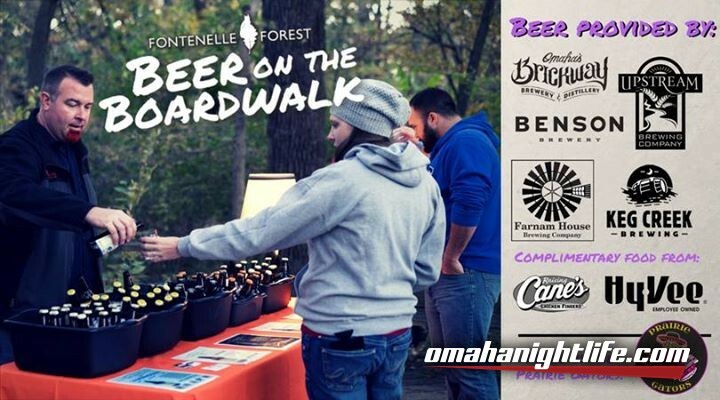 Fontenelle Forest's Beer on the Boardwalk is back by popular demand! There is no event in the Omaha Metro like Beer on the Boardwalk, so we hope you register now for tickets! Whether it's your first time or you've been waiting for this event to return, you will enjoy a relaxing evening in nature with beer, music, food and friends. From 6-9 p.m. September 16, visitors can stroll the boardwalk through the Forest, sampling locally brewed beers from Upstream Brewing, Farnam House Brewing Company, Benson Brewery, Keg Creek Brewing and Brickway Brewery and Distillery. On the plaza you can dance the evening away to Cajun music from the Prairie Gators, warm yourself by fire pits, taste smoked meats from Hy-Vee and enjoy a complimentary dinner from Raising Cane's. Free parking is available at the Southroads Mall with a shuttle. New this year, a free shuttle available from Midtown Crossing will begin at 5:30 and will run round-trip throughout the event.